Fantasy Flight Games has announced a major update to the Dark Heresy playtest rules and as such has decided to extend the playtest schedule by a couple more weeks. Last week, we announced on the Dark Heresy Second Edition beta forums that we will be extending the beta process. Over the past six weeks, we have been following the discussions in our forums, and reading the in-depth feedback that you have submitted. Because of your input, we are making significant changes to Dark Heresy Second Edition. This is an excellent example of how important the beta process is, and how much we value your involvement. The design team is already hard at work implementing changes to Dark Heresy Second Edition. Dark Heresy Second Edition’s core system will be revised to follow (with some important exceptions, some of which are outlined below) the development vein of Only War and Black Crusade. 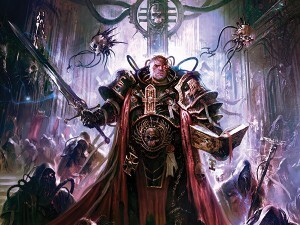 This new course will enable Dark Heresy Second Edition to become the latest and best iteration of the Warhammer 40,000 Roleplay system. Due to the extensive nature of the changes to Dark Heresy Second Edition, our next update will be available at the end of November. Instead of a list of changes, this update will be a new and complete document containing the newest iteration of Dark Heresy Second Edition. Everyone who has purchased the Dark Heresy Second Edition Beta will be able to download the new version of the beta free of charge, and, of course, will still receive their $20 credit toward the purchase of the final game.